Yes, the EU’s new data protection regulation will be implemented shortly. The situation is a little bit like it was with REACH. Companies have known for a long time that they need to act, but are not responding until the last minute. Smaller companies in particular, which do not have an army of IT specialists, are often overburdened with the correct implementation of the data protection regulation. Errors in the handling of customer data will be almost inevitable – at the local soccer club, the hobby blogger, the carpenter’s shop around the corner, the medium-sized plastics and rubber processor, and perhaps even for you? ** Please feel free to include this e-mail address in all your TPE-related mailings, newsletters, etc. Every three years elastomer experts from Germany and abroad come together in Nuremberg on occasion of the German Rubber Conference (Deutsche Kautschuk-Tagung, DKT). 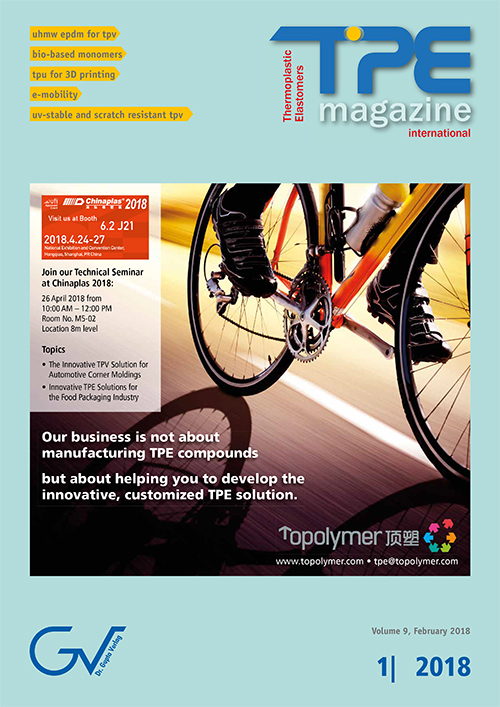 This key event for professionals along the complete supply chain of elastomers is a unique combination of a trade show and a conference. The exhibition offers a multitude of opportunities to network and to get profound insights into the current state of this dynamic industry and to get informed about latest developments in materials and processing technologies. The four-day conference is a podium for top-level speakers from science and industry. The event is a unique opportunity for OEMs to get a comprehensive overview of the innovative strength and technological leadership of the elastomer industry as a reliable partner for their current and future requirements. Organiser of this meeting point for the rubber industry is the German Rubber Association (Deutsche Kautschuk-Gesellschaft, DKG). The German plastics and rubber machinery manufacturers rush from one record to the next. They could increase their sales by another 5 % in 2017. “The past year has been in line with the positive development since 2010,” Ulrich Reifenhäuser, Chairman of the VDMA Plastics and Rubber Machinery Association, is pleased. “I am all the happier that we could surpass the original optimistic forecast of 4 % with this increase,” he added. Since the economic crisis, which had also affected the plastics and rubber machinery manufacturers, this has been the eighth year of growth in a row. The current boom has been lasting unusually long. The last 2 – 2½ years has seen some major activity in M&A related to the polyurethanes industry. Changes are underway and M&A activity is one source of data to assess what strategic directions are being taken. This article looks at trends identified from over 120 publicly reported deals in the last 2 – 3 years. These are relentless consolidation, focused restructuring around core activities and access to growth markets. The arrival of Chinese companies on the global stage is also highlighted. 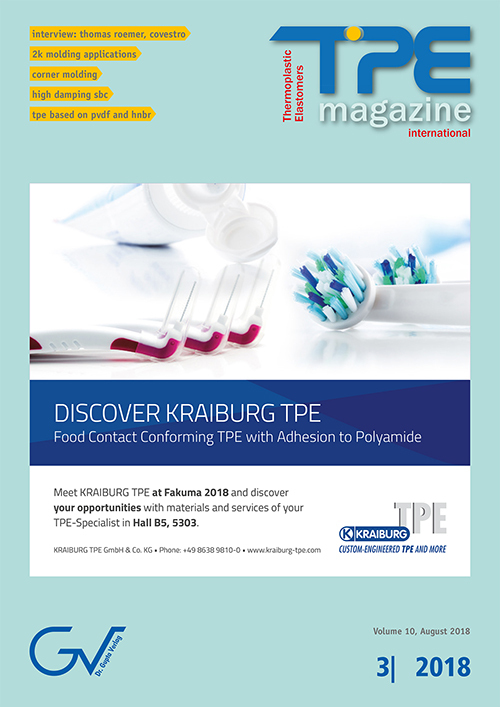 The German TPE compounder Kraiburg TPE just celebrated the opening of a new extrusion line at its headquarters in Waldkraiburg. The company also made significant investments in its US and Asian sites. In 2016 the company moved to a new production plant near Atlanta, GA, USA, and an additional new line has been put into operation at the Kuala Lumpur plant in Malaysia. More investments in Europe and Asia are in the pipeline. The automotive industry’s demand for soft-touch plastics enabling premium aesthetics and haptics is steadily increasing. 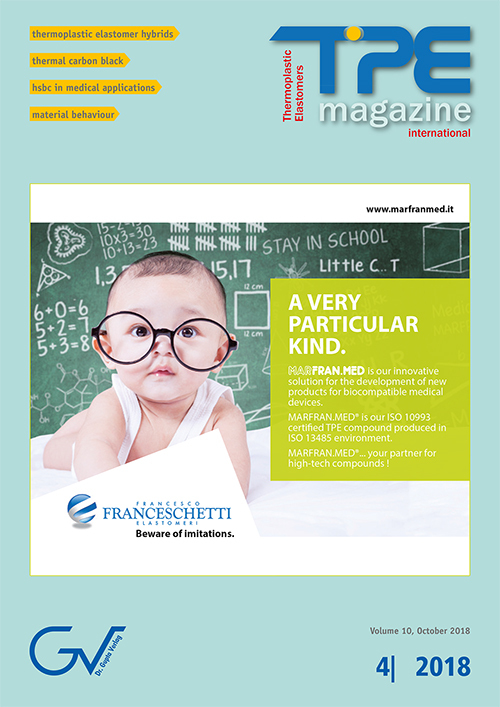 After the acquisition of the Italian TPE compounder API, Trinseo is able to offer a broad portfolio of corresponding hard and soft materials. The new portfolio includes soft-touch plastics with very good overmoulding adhesion to most common rigid plastics, including Trinseo’s Magnum ABS and Pulse PC/ABS blends. Since its introduction at K2013 Arburg has constantly developed the technology of the Freeformer. Today, a whole range of different materials can be processed by this revolutionary additive manufacturing technology. Among these materials are several TPEs and Arburg together with its partners is constantly expanding the material database. In April 2018 the company held a Freeformer User Day in Lossburg. Numerous specialised 3D printing trade shows are on the calendar of the Lossburg based company, such as Rapid.Tech and formnext. Most recently, the company gave an impressive demonstration of the potential of Arburg Plastic Freeforming (APF) in 3D printing of TPE materials at the Arburg Technology Days and at NPE2018. Lubrizol has announced an update to its global expansion programme supporting its Engineered Polymers thermoplastics polyurethane business and growing global demand for its Estane TPU, Pearlthane TPU, Pearlbond TPU, and other product lines. The programme is said to comprise multi-million-dollar expansions, with a combined investment of nearly USD 80 million. TPEs vary in their position on their life cycle curve. Some date from the 1960s, e.g. SBCs. New variants with a broadened footprint, for example low molecular weight SBC are emerging to open new applications. New market sectors are opening, for example autonomous/semi-autonomous vehicles that will provide opportunities for TPEs with new properties and new fabrication processes. Addressing the limited availability of fossil fuels and the reduction of greenhouse gas emissions are two great challenges of our generation. 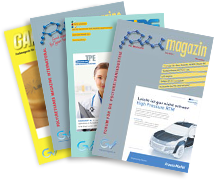 The Arlanxeo developments of high-quality EPDM grades, produced via post-metallocene catalysis (Keltan ACE) and based on ethylene from biomass (Keltan Eco), were aimed at improving the sustainability of EPDM rubber. Extensive studies have shown that the technical performance of these new EPDM grades are identical to that of conventional EPDMs produced via Ziegler Natta catalysis and of those from monomers based on crude oil. Thermoset EPDM compounds and thermoplastic vulcanisates (TPV) have been developed, combining Keltan Eco EPDM with green fillers, plasticisers and thermoplastics, resulting in EPDM products with up to 90 % sustainable ingredients. Mineral oil is a significant component of thermoplastic elastomers (TPE) that extends the rubber-like plastic and softens it for soft-touch applications. Clear, highly refined process oils allow color match and color stability for these TPEs. The higher the molecular weight (MW), the lower the volatility of these oils, which is important for higher temperature applications like automotive interiors. 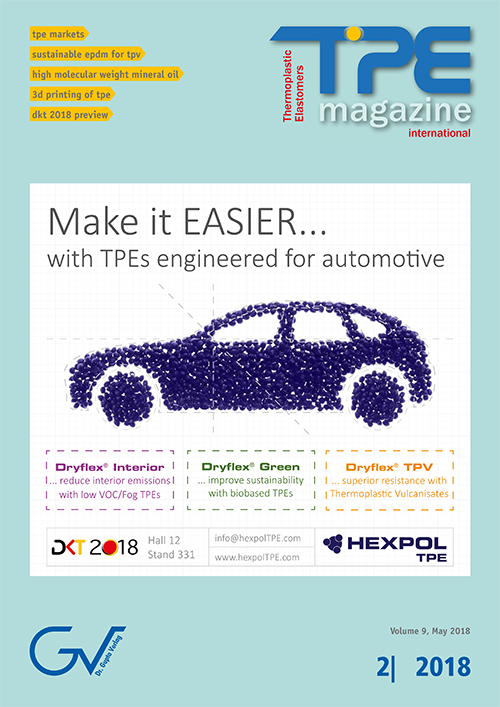 The industry standard TPE process oil Chevron ParaLux 6001 has the required properties to meet the automotive fogging requirements while allowing color match and color stability. A newly introduced, higher MW, clear oil; Renoil 1500-LV, has been compounded into a standard SEBS TPE formulation resulting in significantly reduced fogging.